As an American, I must admit that I have a visceral anger and embarrassment when I examine the growing evidence of Russian interference in the US election in favor of a carnival barker with no right to be anywhere near the White House, let alone the Oval Office. The favoritism, if not the endgame, is clear. What does Putin expect for this support? Did he put a crony in office? Are we looking at a Manchurian (Muscovite?) Candidate? Well, let’s not get too carried away. Did Putin simply support the candidate with the most pro-Russian sympathies? Most likely. Is Putin’s endgame even longer? Did he just plant an awesomely incompetent seed with the hopes of cultivating such instability that we will soon see the unraveling of the American Empire? Ahhh. None of us really know the answer to these questions. All we can do is speculate and turn to history for some possible explanations. The American business elite has, arguably, the most extensive history of politically meddling in sovereign nations going all the way back to the early 19th century. These early “filibusters” by American opportunists and adventurers often ended badly, culminating in the disastrous presidency of William Walker in Nicaragua. These filibusters were clear violations of American policy and condemned by the U.S. government, but such legalities were ignored, and filibusters were celebrated, especially among the Southern slave aristocracy. The filibuster movement was the forefather of later American foreign policy, conducted largely for American business interests. Hawaii is the test case. When Queen Liliuokalani succeeded to the throne of this Pacific kingdom she was dismayed at the growing power of the American business class, especially the sugar industry. She attempted to reign in this growing power, promising a Hawaii for Hawaiians. Well, this would not do. American business interests under the leadership of Sanford Dole overthrew the recalcitrant queen. When President Cleveland condemned the coup and ordered the queen restored, Sanford Dole simply ignored him, established himself as the president of the new Republic of Hawaii and waited for a more sympathetic administration to incorporate the archipelago. 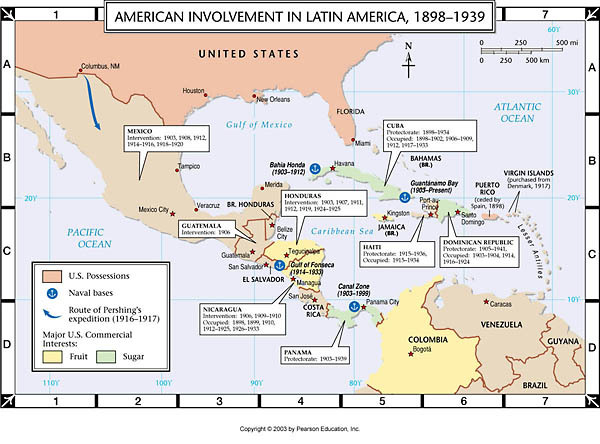 The Spanish-American War left the United States holding an expansive Caribbean and Pacific maritime empire. Cuba was “liberated” from their Spanish overlords and all the Cuban people had to do was swallow the Platt Amendment that gave their new American overlord’s veto power over their sovereignty and a permanent military presence at Guantanamo Bay. Puerto Rico became an American commonwealth, raped of its resources and relegated to a permanent state of poverty, debt, and subservience to corporate patronage. The Philippines were just flat out conquered with great resistance from the Filipinos. This resistance was met with an American military campaign that would resemble later intervention in Vietnam, replete with massacres of civilian villages, torture, including the introduction of waterboarding, and concentration camps. In retaliation for a Filipino sneak attack against an American military company, General Jacob Smith ordered his underling to, “Kill and burn, kill and burn, the more you kill and the more you burn the more you please me.” Smith ordered that anyone over the age of ten who does not surrender was to be shot. No prisoners. The Spanish-American War launched the United States into the global competition for empire. Having effectively “pacified” the indigenous population and consolidated its regional empire, the United States unfolded the global map. Its first focus was its immediate back yard, expanding on the Monroe Doctrine to justify intervention in the sovereignty of its southern neighbors. This included economic interference, referred to as Dollar Diplomacy, through which the United States used its vast wealth to indenture poorer nations to its own agenda. This played out in Nicaragua when the Taft Administration backed the overthrow of José Santos Zelaya in favor of their approved dictator, Adolfo Díaz. U.S. political intrigue played a role in the U.S. acquisition of the Panama Canal Zone. When Columbia turned down American offers to purchase the land on the isthmus, the Roosevelt Administration, via its contact with Philippe Bunau-Varilla, encouraged and supported Panamanian secession. When Panamanians later balked at the exploitative Hay-Bunau-Varilla Treaty, they were threatened with the withdrawal of U.S. military support and the return of Columbian forces. Of course, military intervention always hung in the background of all U.S. interventions. This was more than an idle threat. American economic and political machinations, despite the democratic pretense, always resulted in increased inequality, autocracy, oppression and the inevitable social instability, uprisings, and demands for democracy. Demands for a democracy that privileges the people over American business interests would not be tolerated, so the military became the final tool for stabilizing these countries–for their own good, of course. In the early twentieth century, the United States military was constantly in action. This was true despite the fact that U.S. soldiers were only engaged in a declared war for less than two years. Most of this combat experience was in perpetuating what has been aptly called The Banana Wars. During this time the United States military intervened in or occupied almost every nation in the Caribbean including long-term occupations in Haiti, the Dominican Republic, and Nicaragua. U.S. dominance that emerged from the end of World War II encouraged the United States’ power elite to raise political interference in other nations to a high art form. The United States used economic pressure and political networking to influence foreign governments and elections. The Marshall Plan was an early example of economic coercion, demanding that recipient nations elect representatives approved by U.S. interests, many of whom were former fascists, or risk losing vital funding. When such soft, acute mechanisms were insufficient, more direct covert strategies were used, the CIA served as the active arm of this policy. Among the very first successes for the CIA was in swinging the Italian elections of 1948 to the U.S. friendly Christian Democrats. American political interventions, usually run by the CIA included funding anti-communist forces in Greece and Turkey that inspired the Truman Doctrine, the American policy that it would take it upon itself to support “free peoples” throughout the world. Ramon Magsaysay, “The Eisenhower of the Pacific,” was a CIA asset. Though the Philippines were “given their independence” in 1949, that should not be taken to mean that the Pacific nation was really independent after half a century of American dominance. In 1943 the CIA ran the campaign of Ramon Magsaysay, known as The Eisenhower of the Pacific. To the north of the Philippines, Japan’s first “democratic” election was influenced by U.S. funding of conservatives. Meanwhile, to the south of the Philippines, the United States was investing in military bases in Australia. When a liberal government under Gough Whitlam threatened the status of those bases and questioned the Indochinese War he was deposed by a combined British MI6 and CIA operation run by Marshall Green. Green was known as “The Coupmaster” because of his role in the overthrow of Indonesia’s President Sukarno in favor of the brutal General Suharto. Between the Japanese and Philippine elections in the late forties and early fifties and U.S. interventions in Indonesia and Australian in the late sixties and early seventies, the United States infamously supported the election of the unpopular and corrupt Din Diem in South Vietnam. That ended well. By 1963, the Kennedy Administration participated in a coup to overthrow Diem–this would result in Diem’s assassination, though there’s no indication that the Kennedy Administration supported that extreme. It’s not that the United States had anything against political assassination. This was clear when the United States conspired with Belgium to assassinate Congolese Prime Minister Patrice Lumumba. When the United States was not successful in shifting political outcomes in an important nation, it dedicated itself to overthrowing the offending leadership. This often meant supporting fascist style dictators and oligarchs. Such was the case with Iranian Prime Minister Mohammed Mossadegh in 1953 who was deposed in the interests of restoring the dictator Shah Reza Pahlavi. The United States was involved in the overthrow and possible assassination of Marxist Chilean leader Salvador Allende in favor of the criminal Augusto Pinochet. In the interests of the giant United Fruit Company, Guatemalan President Jacobo Arbenz was overthrown in favor of the brutal Carlos Castillo Armas, who was later assassinated. To justify these political maneuvers and especially the subsequent military interventions such as those in Korea and Indochina, the United States maintained a constant propaganda campaign against the communist threat, the need to win the cold war in order to preserve freedom. This concept of freedom did not include the freedom of sovereign peoples to choose left-wing governments that might institute reforms beneficial to the people and costly to U.S. business interests. All such movements were to be understood in terms of the Stalinist Stain rubbed into all radical movements. No. By freedom, the United States meant the right of American business interests to expand their global networks. It was difficult to perpetuate this propaganda once the Soviet Union fell, however. When there was little chance of a Soviet renaissance, the Clinton Administration threw its support behind Russian candidate Boris Yeltsin. The intent was to bring the former Soviet Union into the global corporate community through economic shock therapy, which meant the promotion of deeply unpopular austerity measures. According to Stephen Cohen, “Political reform came to mean little more than fulsome support for President Boris Yeltsin because top Clinton officials explained, ‘Yeltsin represents the direction toward the kind of Russia we want. '” Perhaps The Orange Don represents the kind of United States that Russia wants. The United States continued to throw its weight in foreign elections after the fall of the Soviet Union. According to Thomas Carothers, quoted in the LA Times, “The U.S. didn’t want to see left-wing governments elected, and so it did engage fairly often in trying to influence elections in other countries,” It helped swing the Nicaraguan election against Daniel Ortega. The CIA had operatives working to overthrow Jean-Bertrande Aristide in Haiti. The US influenced elections in Czechoslovakia and Yugoslavia. None of this history justifies current Russian actions. Indeed, according to Don Levin, a foremost scholar in this area, Russian interference in foreign elections is nothing new either. It’s likely that for every example given above of U.S. intrigue, a Russian example could be found. Regardless, if the American public is to be justifiably outraged over these actions if it turns out that we are willing to unseat a president over this issue, then we need to take a cold, hard look at our own place in history and our own reputation in the world. Scalia’s Seat Must Remain Unfilled!